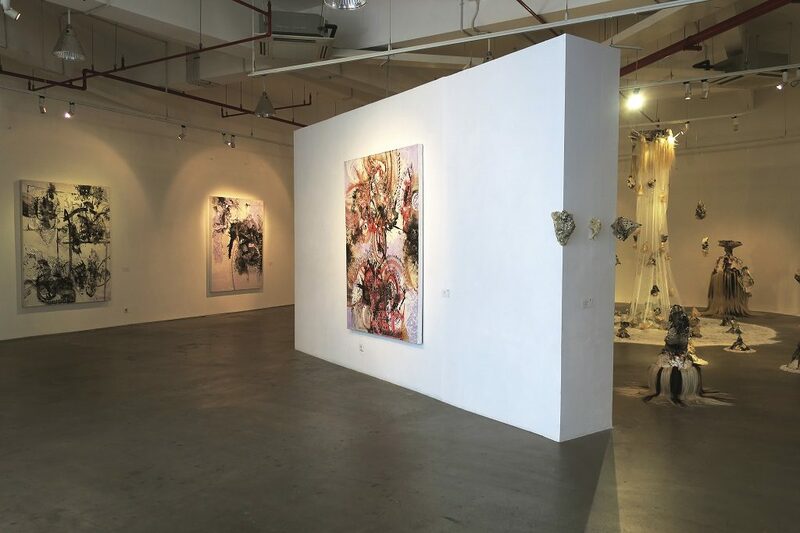 Balinese artist Nyoman Erawan presented ten paintings and an installation in his solo exhibition at Art1 Newseum in Kemayoran, Central Jakarta between November and December 2016. 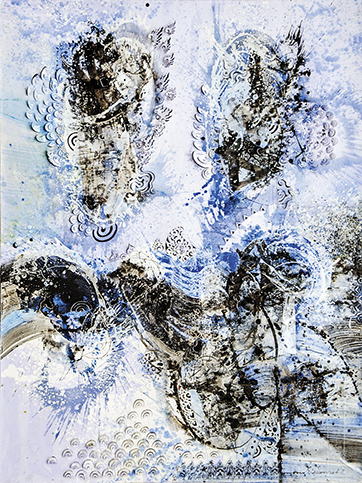 The exhibition raises issues regarding Indonesian abstract art. He continues to explain that the development of Indonesian art of abstract painting began to be known since the 1960s, with historian and art critic Sanento Yuliman explaining the term ‘abstract’ as meaning to “mention the style of painting that did not feature forms which we recognize as such forms of objects or patterns which we see in the reality around us... does not depict objects (hence called ‘non-objective abstraction’) nor figures (hence called ‘non-figurative abstraction’)”. Meanwhile, the title of the show Shadow Dance itself contains words that point towards representation and figures. Shadows are representations of objects upon which light shines, whereas dances are choreographed movements of figures. So, actually from the title, the artist has made it clear that the paintings are not intended to be seen as non-figurative nor non-objective abstractions. In fact, there are clear references to the traditional wayang shadow puppet performances for which Java and Bali are famous. Perhaps, as the curator has pointed out, the paintings in the exhibition do not present any sign of objects that we can easily recognize, nor the human figure. However, there are clearly traces of movement and expression and even symbols that seem to be related to Balinese traditional performing arts. Indeed, Zaelani eventually observes that through his paintings Nyoman Erawan is pursuing another form of representation, which aims to show ‘representation about/of space’ as mentioned in Julian Bell’s book, What is Painting? Representation and Modern Art. 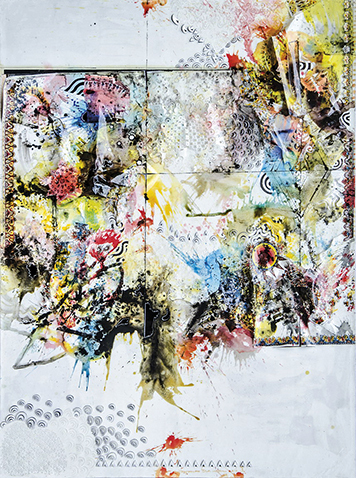 He explains: “The overall display shows the results of the processing of the areas field space (canvas) which is vertical (directed the nature of the forms bottom-up), explains the interest in the problem Erawan called ‘the principal that connect people with the question of creation and God/Deities”. 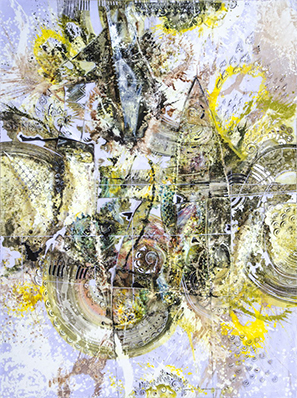 Sanento Yuliman also explained that a person’s acceptance —both physiological and psychological— towards the results that are shown by abstract paintings will explain the attitudes and interests of that person’s acceptance towards the richness and depth of experience the world of form in such a variety of visual experiences. Secondly, Erawan has managed to combine other working techniques that are very inspiring, such as tatahan (chiseling) techniques - which are commonly used in Balinese carving traditions - along with the regular and commonly known methods and techniques (including strokes, splashes, incision, tearing, or melting). By doing so, he encourages opening the issues about abstract painting to three-dimensionality and issues about space beyond the surface of the canvas painting itself. “He opens the possibility that meaning could be developed between the front and rear of the painting surface, both physically and conceptually,” stressed Zaelani. Thirdly, Erawan tries to change textural perceptions about painting surfaces as different spatial experiences. Nyoman Erawan’s Shadow Dance might be artistic abstraction, but more importantly it is about expression. It is, as Zaelani mentioned, about space, but it is also about time. Like any other form of Balinese art, it is about time, space and movement.